National Football League Commissioner Roger Goodell has announced that he will push for a longer schedule, expanding the regular season from 16 to 18 games while shortening the pre-season from four games to two. The expansion would tack two games onto the end of the season, pushing the regular season into mid-January, with a Super Bowl taking place in the second half of February. The plan faces objections from some players, facilities and other sports properties, but according to radio host Matthew Coller of Rochester, N.Y., the proposal could add $500 million to the league’s bottom line. The proposed expanded schedule is expected to be a bargaining chip during the league’s Collective Bargaining Agreement with the players association, whose contract expires before the start of the next season. While the NFL Players Association has not taken a position against an expanded schedule, many individual players have spoken out, arguing that adding two games each year could potentially shorten a player’s career. Some fans have expressed opposition to an expanded schedule, Coller said, arguing that it could push up the price of tickets and add more end-of-season games that don’t matter. Last season, the Indianapolis Colts benched their starters for the final three games of the season after locking up a playoff berth, disappointing many fans who hoped the team would be competitive all season long. Plus two more games in January might be a hard sell to fans who live in colder climates like Green Bay, Wis., or Buffalo, N.Y.
For NFL venues, the new schedule could present a challenge to the already full booking calendar for many stadiums. Doug Thornton, GM for the Superdome and senior VP for SMG, said that adding additional games isn’t particularly lucrative for stadiums. Thornton said an expanded schedule could interfere with long-standing Mardi Gras events. The New Orleans tradition is based on the Easter calendar and doesn’t fall on the same dates each year. His tenant team, the New Orleans Saints, is expected to play far into the post season this year — the team won last year’s Super Bowl and quarterback Drew Brees is the highest rated player in the NFL. Plus there’s the National Basketball Association’s All-Star game, which takes place weeks after football wraps up, and NASCAR and professional golf also host high profile events in February. Most sports would be loath to compete against the NFL. Last year’s Super Bowl was the highest rated television show of all time, drawing 106 million viewers. Often, an NFL preseason game can draw the same television rating as a World Series game. Miller said he doubted that an expanded schedule would affect Reliant Stadium’s other tenant, the Houston Livestock Show and Rodeo, but he did add that it might affect the stadium’s ability to host future Super Bowls. Also watching the NFL schedule closely is Ken Hudgens of Feld Motorsports. The company typically tours Supercross and Monster Jam during those months, and said it’s spent years building a fan base around early winter shows. “Right now, in the places that we’re playing stadium-wise that have NFL teams, we’re either working around their schedules in the off-week between the NFC-AFC Championship and the Super Bowl, or we’re rolling the dice in places like the Georgia Dome (Atlanta) and Qualcomm Stadium (San Diego) and hoping that a home playoff game doesn’t bump us out,” he said. Goodell is expected to push the expanded schedule during the next round of collective bargaining talks, Coller explained, “because they hold all of the cards. Their $4.5 billion in TV contracts are guaranteed, whether the players play or not. The NFL still gets the money, while the players will be sitting on their hands not earning a dime” if they get locked out. Regardless of what happens, Thornton said many facilities will work to give the NFL whatever it wants. 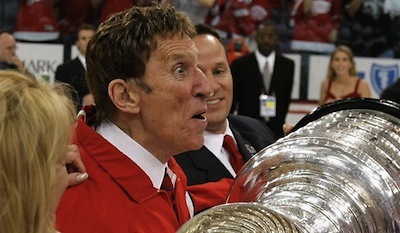 Detroit Red Wings owner Mike Ilitch has announced his intention to purchase the Detroit Pistons and possibly move them out of the suburbs and into a new downtown arena. If he is successful, he’d be the owner of three professional sports teams, including the Detroit Tigers of Major League Baseball. The 81-year-old creator of the Little Caesars Pizza chain said he was concerned that the Pistons might move out of state. Pistons Owner Bill Davidson died at the age of 86 in March 2009 and his widow Karen Davidson has since put the team on the market and entertained several overtures from out-of-state bidders. Of course, a Piston’s buyer would get much more than a team. Palace Sports and Entertainment also manages the DTE Energy Music Theatre, as well as the Palace of Auburn Hills, a suburban arena often viewed as one of the top NBA facilities in the U.S. If Ilitch bought the team, he might attempt to move the Pistons downtown, near the bulk of his real estate holdings. Earlier this year, Ilitch hired former Palace CEO Tom Wilson to work for Olympia Entertainment, just as the Red Wings lease for Joe Louis Arena was set to expire. The team is considering renovating Joe Louis Arena, or possibly building a new arena. The price tag for that type of project could be anywhere from $200 to $500 million, although the low price of real estate and construction in Detroit could top the project out at $300 million. It’s unclear how a new project would be financed, but Ilitch already has a number of properties located downtown including Detroit’s Fox Theatre, the Masonic Temple and City Theatre, along with the MotorCity Casino. There’s also a possibility that Ilitch could move his team to the Palace of Auburn Hills — or abandon the space and sell it at a markdown. “Keep in mind that the Palace and Joe Louis compete against each other for concerts, so Ilitch is probably going to look to consolidate to one arena,” Tavares said. The Pistons remain a popular team, winning the championship in 2004 and making it to the playoffs every year until 2009. Last season they only won 26 games, but the team has signed Tracy McGrady in hopes of improving on-court performance. Landon Donavan will lead a squad of MLS All-Stars in a friendly match against Manchester United. With more than 700 million people worldwide watching last weekend’s World Cup finale, there’s no time like the present to cash in on the renewed interest in soccer in the United States. And Major League Soccer isn’t taking any chances with its upcoming North American Tour, which will hit four major markets in a bid to keep soccer fever going by tapping into one of the planet’s most recognized sports franchises, England’s superstar Manchester United. Manchester United carries an approximate $2 million per game price tag, said Courtemanche, so all four dates on the tour will play to big crowds with a minimum capacity of 45,000 up to a maximum of 70,000. He expects sell-outs at each venue based on previous visits by international superstar teams. Among the most anticipated stops is the July 28 All-Star game at Houston’s Reliant Stadium, which will get a boost from an appearance by U.S. soccer star Landon Donovan in a game Courtemanche dubbed “MLS versus the world.” It is the first time Manchester will be playing against an all-star U.S. team, whose roster is made up of players who are, thanks to the World Cup, now international stars. Though the World Cup has helped pique interest in soccer in North America, Courtemanche said the international competition on display during the tour will dovetail with the organization’s paramount belief in using the sport of soccer to promote MLS. The legendary football club, known as the Red Devils, has already brought its 23-man travel roster – including such major names as midfielders Ryan Giggs and Paul Scholes, as well as Holland’s Edwin van der Sar, Portugal’s Nani and Bulgaria’s Dimitar Berbatov – to North American shores in early July to begin doing press for the events. And, in a bid to tap into the huge soccer-crazy Hispanic population in major markets, Manchester’s new Mexican forward, Javier “Chicharito” Hernandez will join the tour just before the Red Devils’ game against the MLS All-Stars in Houston on July 28. Rob Thomson, VP of Communications for the KC Wizards, said he’s excited to mark the first event at the new Arrowhead Stadium following a two-year renovation. With the next closest MLS cities a nine-hour drive away, Thomson expects to draw from a wide region for the Manchester game, the biggest soccer event of its kind in the area since a 2001 World Cup qualifying match that drew a more modest 37,000 fans. “Two months ago [we would have been happy with the current 50,000 in sales], but now? No. We have our eyes on the prize of having a soccer sellout in a huge venue,” he said of the hype created by the World Cup. The Wizards ran local TV ads for the game during every televised World Cup match and there has been local and regional print advertising as well as a healthy dose of online outreach. Because so many soccer fans follow the international game on the Internet, Thomson said buying keywords on Google, Yahoo and AOL should pay dividends at the box office, in addition to an outreach to club soccer teams in nearby Omaha, Wichita, Des Moines and the local Latino communities. In addition, Manchester players have made themselves available to answer questions in writing and on video and Thomson said local TV and radio stations have been playing the clips on a daily basis for weeks. While he would not discuss the marketing budget for the game, Thomson said it was a “healthy” separate budget from what the team typically spends on advertising and that it came out of the Wizards budget, with help from the NFL’s Chiefs as well. The football franchise also shared their season ticket database and e-mail list to help spread the word in an effort to showcase the stadium in a bid to bring the World Cup to Kansas City in the future. The tour – presented by MLS and the Creative Artists Agency – marks the first time Manchester has played in the U.S. Among the promotional efforts being employed are multitiered ticket packages, which include a Visa presale, then windows for season ticket holders and 4-pack offers that include tickets to three Houston Dynamo games along with the purchase of an All-Star game ticket.